Americade is coming! Warrensburg Bike Rally opens on Friday. 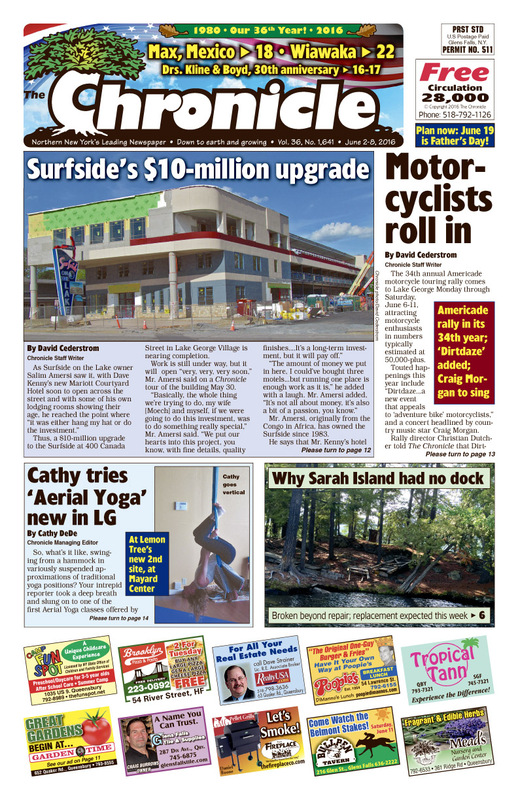 Surfside on the Lake – $10-million upgrade. Cathy tries ‘Aerial Yoga’ in Lake George. Why Sarah island had no dock. Valedictorians. Cleverdale Store sold. Green Party candidate coming to area on Thursday. Granville’s Slate Valley Museum. Kline & Boyd optometry marks 30th. Max in Mexico. Lots of real estate listings. Looking for the arts, concerts, etc.? The Chronicle has the region’s best Arts & Entertainment section!